When men ate in caves with their hands, the tools their hands made meant survival. And once the first faction became a lesser to itself, the template for the future became keep the faction lesser. Any faction kept the lesser has been the key to knowledge ever since. Give me (me being you) some time to figure. You will lose. Only winner is survival. Something human fits the bill. Take or leave this worldly good. Nothing worthy to attain. Timeless matters meet the standard. Massive constant preordained. Who do die done dada goner. Who do die do dada gain. Who do die done did discover. Every dada is one discarded massive pain. 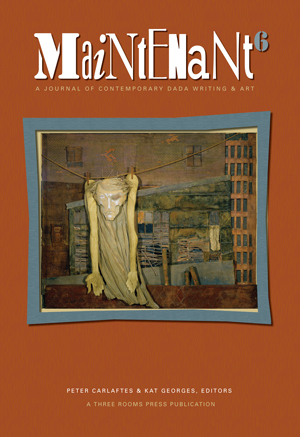 Maintenant 6: A Journal of Contemporary Dada Writing & Art is the fifth edition of an annual collection of contemporary Dada work inspired by Dada instigator and Three Rooms Press spiritual advisor Arthur Cravan. This issue, edited by Peter Carlaftes and Kat Georges, includes bold poetry, cutting-edge visual art, essays and word art from more than 100 Neo-Dadaists worldwide. 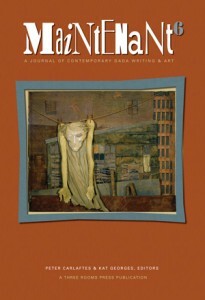 The cover features a color image of a collage by the incredible poet, artist and wife of Arthur Cravan, Mina Loy. You are entitled to ONE copy for just the cost of shipping. Select either U.S. Contributors 1st Copy or Int’l Contributors 1st Copy (for all non-US contributors). For EACH additional copy, select U.S. or Int’l Contributor-Additional Copy. All prices include shipping.